At BTI Solar, we are committed to helping you achieve energy savings while helping the environment. 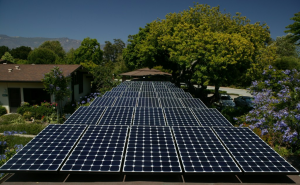 We specialize in residential and commercial solar systems – Off-Grid System and On-Grid System. BTI Solar offers consultation services to engineering companies and consumers who need help with the design and problem solving of installations. Our solar systems are designed using the finest quality components to meet the customer’s needs, taking into account the site conditions. Each of our systems will meet or exceed the code requirements of the jurisdiction having authority for that particular job. BTI solar technicians are the best trained in the business and it shows in the quality of our installations. The solar systems we install are designed to work correctly and be aesthetically pleasing to the eye. We are constantly complemented on the quality of our work. At BTI Solar, we source the finest quality components for our solar systems. These components are covered by the most comprehensive warranties in the business. The company also stands behind its workmanship and offers an industry leading workmanship warranty. For customer peace of mind, every proposal includes a written warranty statement. 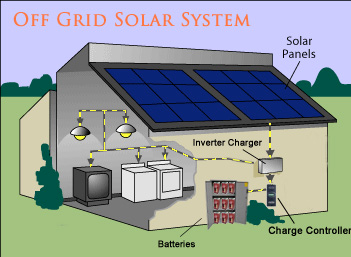 A Grid-Tie/On-Grid Solar Electric System consists of multiple solar electric panels that make up an array that is connected to an inverter / micro-inverters which convert the DC electricity into AC electricity. The electricity is fed from the inverter to a back fed circuit breaker in your electric service panel. When the system is making more electricity than the home or business is using, the excess is fed back into the electric grid through the electric meter that the home’s electric system is connected to. 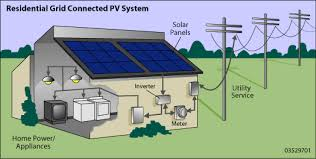 This type of system is the most common type of solar electric system. Since these systems are connected to the electric grid, it is not necessary to produce 100% of your electricity through solar alone, and excess production can be sold back to the utility company. Monitoring equipment can be installed that shows in detail the amount of solar electric generation that is taking place. 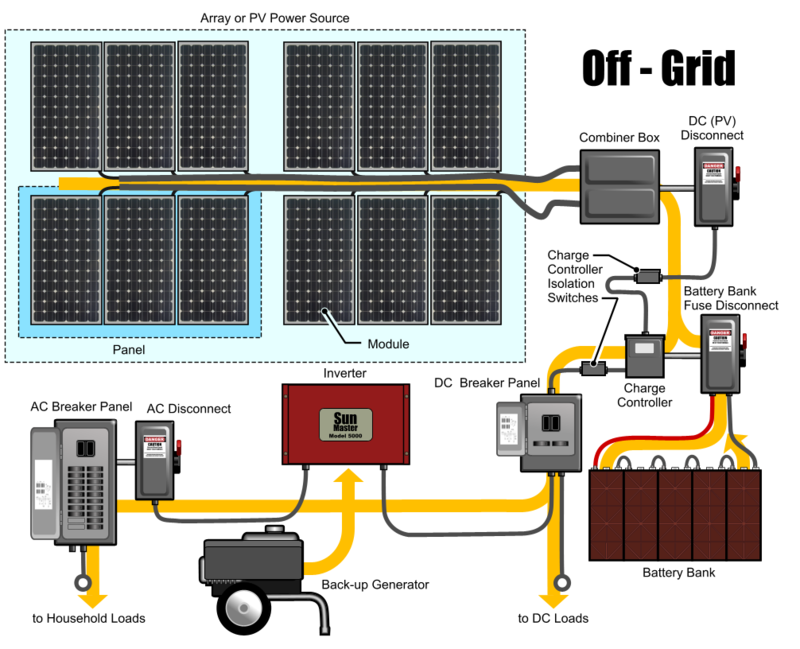 An Off-Grid Solar Electric System consists of a solar array (a collection of PV solar panels) that is connected to an inverter, a transfer switch, a charge controller, and a battery bank. The charge controller charges the battery bank that feeds the inverter with DC electricity that is converted to AC electricity that is supplied to electric circuits. There may be additional DC circuits that are fed directly through the batteries and charge control. This electric system is not connected to the electric grid. These systems are typically seen in remote locations without utility service or stand-alone lighting. Battery backup systems are in general a more expensive option. These systems depend on producing 100% of the energy needs either immediately or as excess that is stored in the battery system until needed (usually at night time or during peak hours in daytime). Monitoring equipment has to be used in conjunction with these systems to ensure that usage is kept below output / battery storage. 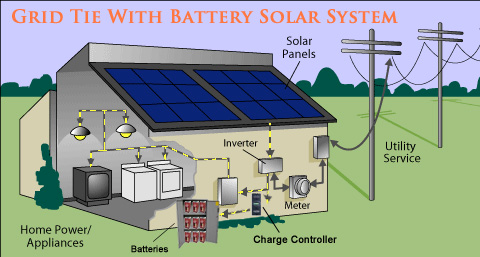 A Solar Electric Grid-Tie (On-Grid) / Battery Backup System is a combination of the two previous systems. During daylight hours, the solar electric array charges the batteries and supplies power to a special dedicated load electric service panel. Any excess power is fed to the grid. 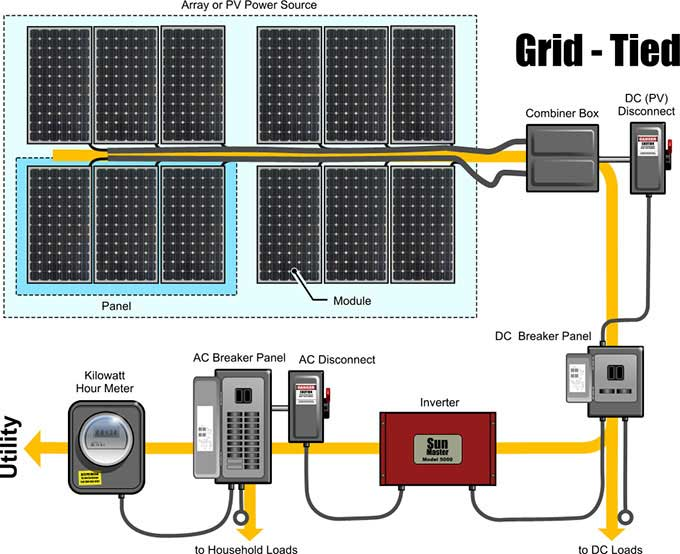 In the event of a grid failure / outage, the system disconnects from the grid and the solar array charges the batteries which supply power to the inverter to power the loads in the dedicated load service panel. When the grid is down, only the loads in the dedicated load panel are powered, not the entire home. Critical loads are typically refrigerator, stove, fans, some lighting, and possibly the washing machine.